The laws of the Member States of the European Union and the tax treaties concluded by them - being part of their national laws - must be consistent with European Community law. Apart from EC Directives and Regulations, the EC Treaty itself contains rules directly applicable to matters of international taxation. In this context the decisions of the European Court of Justice on the fundamental freedoms laid down in the EC treaty are of primary importance. If a provision of a tax treaty is in conflict with the EC Treaty, it is superseded by the Treaty provisions. The EC Treaty may therefore have the effect of changing the content of tax treaties, a matter of crucial importance to international tax planning techniques. This collection of essays examines the effects of primary European Community law, in particular the fundamental freedom provisions in the EC Treaty, on tax treaties concluded by the Member States. 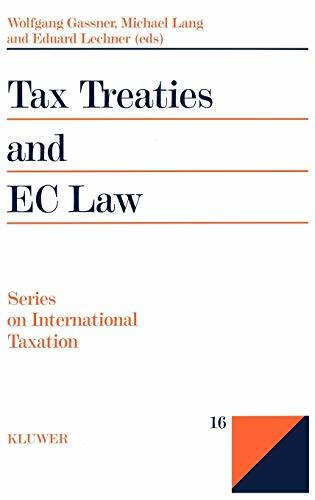 Using the method of examination employed by the European Court of Justice, the contributors to this volume present a systematic analysis of the effects of the interaction of national tax law, tax treaty law and the EC Treaty. Lang, Michael; Gassner, W.; Lechner, E.